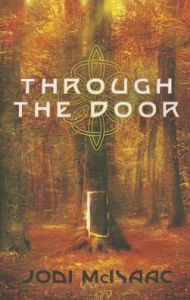 Through the Door is an urban fantasy based on Celtic mythology that turns one of the major urban fantasy tropes on its head. Eden is the child of a human mother and a Tuatha de Danaan father. She has been raised without any knowledge of her magical heritage until she develops special powers. The good and bad sides compete to use her powers for their own ends. The trope upending part is this: Eden isn’t the main character. Her mother is. Instead of the usual YA fantasy of the young person discovering her powers and heritage, this book is a fantasy for adults about a mother pursuing her kidnapped daughter. The main character is Cedar, who has to co-operate with her ex’s family to be allowed in on the chase. They are immortal and powerful. The only ones who want anything to do with her want her to forgive her ex for leaving her and get back with him, which is not on her agenda. Cedar has no powers, no knowledge of magic, and nothing to offer but determination. She is largely just along for the ride through a lot of the action. Although it’s nice to see an unusual take on the usual plot, this story just doesn’t have the epic sweep and emotional satisfaction of the tried and true version. Deliberately breaking the plot conventions of genre fiction is a hallmark of literary fiction, but this book is still trying to be an adventure story. The presence of the Tuatha is literal, and the language of the book is action-oriented rather than lyrical, so it’s definitely fantasy genre fiction. There is quite a bit of action, which is handled deftly. There is an interesting plot twist with mermaids. There are heroes, villains, and just regular seeming people among the Tuatha, which is a nice touch. This is the first book in a series, so hopefully one of the future books will be set ten years later than this one, when Eden is 16 instead of 6, and is ready to blossom into who she is and take control of her life. The character with the greatest potential for growth in the beginning of the book is Eden, who is basically a football through the rest of this book. Cedar’s major growth arc is from normal unbeliever to believer in magic, but that’s another of the most overused tropes in urban fantasy, along with the one the author was trying to subvert. The author knows her Celtic mythology, which is revealed bit by bit as the backstory is worked into the main story, and all of these elements are intriguing. The author presents a fascinating backstory about Eden’s powers and why both sides want to have her for themselves. The backstory of Cedar’s romance with Eden’s father is interesting too, and would probably have made a great book one for this series, as the star-crossed lovers plot really never gets too old to re-use. This book is a good read despite its failure to provide the emotional satisfaction of watching the main character grow into something special, contrary to the setup of Eden as chosen one which the beginning leads the reader to expect. I recommend this book for the urban fantasy reader who is utterly bored with the usual fantasy plots and wants something different.